I wrote a bit of a long post yesterday about the Palmy to Whale, and realised I spent a bit of time comparing it to last year. It did set off a bit of a lightbulb moment for me, that although I didn’t have this blog at the time, I did write about it. I sent out a race report to a bunch of people at work who supported me while I was training and raising money. With only minor effort, I managed to dig up the report, so thought it might be interesting as a bit of a comparison! There have been so many generous people who have been supportive of my crazy swimming activities over the past months who have been wanting to know how it all finished up, so I thought I’d put together a little wrap up! For those of you who might not have seen exactly what has been involved, here’s a little summary…. 5 – Friday squad sessions at Bondi….admittedly a nice way to finish up the working week! And 6 races (make that 7 by next week), including my amazing goal swim last Sunday at the Macquarie Big Swim – Palm Beach to Whale beach. As for the big swim, for those of you who have been asking, here’s my Race Report! Let me start by saying I’m not that good a swimmer. I’m actually pretty slow when it comes down to. I have too short a stroke and I may have squandered my 20s and a good chunk of my 30s drinking wine and working too hard and not doing anywhere near enough exercise. The good news is that a year ago a was an atrocious swimmer, and I’ve worked my way to just slow. What I do have going for me, though, is that I’m stubborn (I know, you’re shocked, right?). I keep going no matter what. Even when I’m tired and even when it’s tough. I also trained through the winter and think I’ve had plenty of practice dealing with some pretty tough conditions. So believe me when I say that the Palm Beach to Whale Beach was EPIC!!!!!! I was nervous at the start. Very nervous. There may have been 3 visits to the bathroom in too short a space of time for me to have really drunk that much water! Me, pre-race. Can’t even manage a smile for the camera! I did a bit of a warm-up and that helped – getting off the beach, away from the chatter and into the cool, quiet water. Then lined up and started! I battled through some decent waves at the start, and made it to the first can (that’s what we call buoys in my sport) OK. Then I turned and headed towards the headland. And I swam. And the waves rolled up and down. And I headed along the headland. And the waves rolled up and down some more. And more swimming. And more waves. You can see where I’m going with this, so I’ll give you the cliff notes version. I swam for a really long time. The headland is quite long, and because of a rip they extended the course for us to come in the other side of Whale beach. In total, the race was about 2.8km long. And like swimming crossed with riding a roller-coaster. This is what it look like from the air (last year…clearly not my own photo)…..for me it looked crooked a lot, and like bubbles and splashes and fish and other swimmers! Finally I reached the second can. Then shortly afterwards the 3rd and 4th…they were all grouped together just to guide you in. I caught a monster wave. Big enough to loosen my trusty goggles….so rather than lose them I pulled them down around my neck and finished the race bare-eyed. Eventually, I reached the shore. I could hear the rest of the orange-suited Can Too Crew (and supporters) cheering so rallied for a last dash for glory. And of course got a cramp as a I stood up and landed on my face in the sand. Signature Jacki-move! Undeterred, I hauled myself up, and actually managed a run up the beach, hands in the air, and with a massive smile on my face! I’d done it!!! 68 minutes it took. Well slow even for the average for my division…but I felt like the biggest winner! With my team-mate Sally at the finish line! Exhausted but grinning! 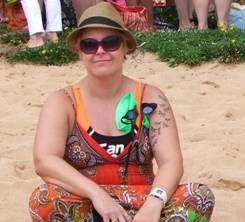 And looking particularly styling in my orange swimmers and green cap! Hint – ocean swimming is not the sport for you if you want to look glamorous! After a drink and catching my breath, I joined the Can Too tent for a celebratory BBQ. Tired and beyond happy! So my next challenge is to join my friend and Can Too first-timer recruit (you may remember a girl named Ronene? *Who swam this event this year, instead of taking photos*) for her goal swim – 2km at the *Other event I boycott for reasons* this Sunday. She’s doubly impressive for swimming her goal swim on her (I’m not telling but it’s a significant) birthday!!! So thanks everyone for the sponsorship and kind words of encouragement! I couldn’t have done it without you! Ah, Palmy to Whale. 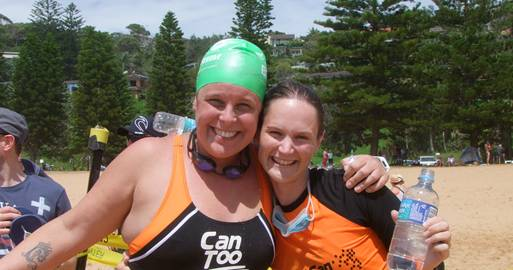 It’s such an event and such a big part of the Can Too journey, It’s literally the “Big Swim” (unless you’re doing the Big Little swim). Advertised as 2.5km, it’s generally longer along one of the most beautiful courses you can possibly imagine. It’s tough enough to be a challenge for just about anyone and just achievable enough that anyone with a decent training plan, good coaches, proper preparation and a bit of a stubborn streak can manage it. It is also the long-course goal swim for the Can Too Swim program. I loved this race last year. It took everything I had to finish it ( it was my goal last year) but I was really elated at the end. I was feeling fitter and better prepared this year, plus a few of my mentees and some of my friends were attempting the race for the first time so I was really looking forward to it. Then I woke up and looked out the window and saw this. Not just raining. Pouring. Absolutely bucketing down. windy and cold and wet and miserable. And definitely not what I had wished for my nervous new swimmers. Still after double checking everything was still going ahead I channeled that stubborn streak of my own, added a brolly, and headed down to my lift. It’s a fair old drive up there from the inner west and took a while, but thanks to our ever-patient driver Ean we were there in plenty of time to register and set ourselves up and check bags and cheer for the 1km event swimmers. Lovely to see so many orange swimmers in the brand spanking new shorter event as well, and I was so proud to see so many of them survive what was a really, really tough event. Possibly the toughest 1km event I’ve ever seen! I’ve had more camera issues (new one bloody well leaked! Again!) so I’m afraid I’m a bit low on photographs from the day. There are a couple from my phone…but with it being that wet you really needed a waterproof feature even on the beach! Anyway, what can you do, but what we train for. I did a bit of a warm up and watched the earlier wave starts. It was quickly obvious that there was quite a sweep from right to left, so my place at the start line was definitely hard right. And then we were off. Funnily enough, although the start was pretty rough, I must have timed it just right and gotten the line spot on. It felt like a couple of porpoise moves and I was through the worst of it and off and swimming. Before I knew it I was at the first can, feeling good, pulled around it and I was off and headed south. I found this out-the-back part pretty hard work last year. It was pretty much the first event I’d ever down that was out around a headland and there was quite a swell, so I was swimming in conditions that I wasn’t really used to. This year, I have a number of swims like this under my belt. I’ve trained all winter, and trained hard with races like this in mind. I’m fitter and stronger and have been working on my technique. It wasn’t a matter of whether I would finish, so I decided to put the boot in and see if I could push myself. I spent a lot of the race counting strokes and doing regular surges. I didn’t want to completely wear myself out, so I’d count out 30 strokes at my regular pace, and then 90 hard. Over and over. It wasn’t a bad way to stay focussed, and it kept me from getting distracted by the view! 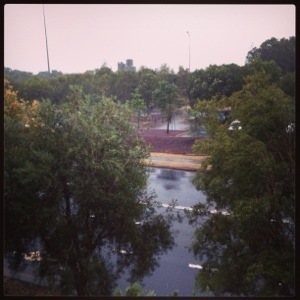 The view…ahhh…even in the rain that is one beautiful swim. I had hoped to finish the event in under an hour. Around the last can I had a peek at my watch and realised it wasn’t going to happen for me (not this year, anyway 😉 ). Undeterred, I decided to finish as though I was just about to make it! I went out very, very hard. I may have slightly gone off track a bit as I discovered a little late I was sighting at something that wasn’t actually the finish line. D’oh! Rookie mistake! I came in a bit to the left of the finish line..which wasn’t too bad in the end, as from the reports of other people, coming in right at the finish line was pretty tough work. I did manage to kind of catch a couple of waves for a nudge in where I was, though. They were already broken and really, really frothy and messy, but they were all going in the right direction so I figured I’d jump on for whatever ride they’d offer. I learnt my lesson from last year, and did a few foot flexes before trying to stand up. It certainly helped as I managed to navigate my way from horizontal to vertical without planting my face in the sand on the way. Win! As usual, there was a noisy orange-clad cheer squad. It is so great to have that motivation at the end when you’re tired and just need a little extra boost to get you out and over the line. Despite the weather, it was a great race, as usual. People who were scared at the start were smiling at the finish line, and we managed to brace the rain and celebrate at the Can Too tent afterwards! I wouldn’t miss it for the world! Finally, a massive congratulations to any and all of the Can Too participants, particularly those who were doing this race for the first time, and even more particularly those who were in my mentor group and stepped up from their initial plan to do the Bondi 2km and pushed themselves to take on this challenge. I am so proud and have found the mentoring journey one of the most rewarding things ever.